Source:The Clinton New Era. September 26, 1918. Page 1. The Clinton New Era. September 26, 1918. Page 1. 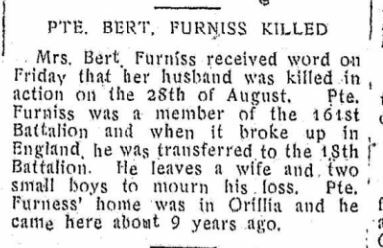 Mrs. Bert Furniss received word on Friday that her husband was killed in action on the 28th of Augusts. Pte. Furniss was a member of the 161st Battalion and when it broke up in England he was transferred to the 18th Battalion. He leaves a wife and two small boys to mourn his loss. Pte. Furness’ [sic] home was in Orillia and he came here about 9 years ago. “Killed in Action” He was killed by an enemy shell during operations new Vis-en-Artois.